We need all (gloved) hands on deck Friday, Nov. 18 and Saturday, Nov. 19 because we are finally ready to plant the Sanchez Street side of the recreation center! As any Upper Noe regular knows, the west side of the building was not planted or landscaped as part of the massive 2008 renovation. Two years and one failed grant attempt after we started, we are now laden with more than 300 California native plants, thanks to a $1,000 gift from the Friends of Noe Valley and donations from the Friends of Noe Valley Recreation Center. Look for a canvas of Siskiyou Blue “bunch grass,” dotted with clumps of yarrow, Humingbird Trumpet and Douglass Iris. The showy “foothill beardtongue” will line the path. In addition, we need volunteers the previous Saturday, Nov. 12, from 9 a.m. to noon to help prepare the site. This second Saturday of every month is a regular grounds-keeping gig, led by Ladybug Gardener Joan Lionberger. A Noe Valley native, Lionberger is passionate about keeping the park looking good and has volunteered more hours than we can count to make it that way. She needs neighbors to lend a helping hand in this extraordinary planting project that has been years in the planning. Upper Noe Recreation Center will convene its first Community Recreation Council meeting Wednesday, Nov. 9, from 7 to 8:15 p.m. in the center’s auditorium.Staff expect to see the eight people who have already filled out applications, but for now, Iglesias is also inviting anyone and everyone to come to the meetings.Topics will include what programs the community would like to see offered, facility cleanliness and safety.Programming of any kind is up for discussion. Teen movie night? Rocket club? More tot programming? Boxing? The Council will work together to see what the Center can offer to make it a hub of neighborhood activity. “It’s just being formed as we’re going,” said Thomas Iglesias, the site’s new facility coordinator. The evening will start with introductions all around before launching into a discussion of the objectives and goals, he said. Councils comprised of staff and local residents based out of each recreation center in the city will eventually shape local programming, an idea the department rolled out about a year ago. Ideally, the Councils have seven members, including one teen.To fill out an application, please ask at the Rec Center, or show up at the meeting, or print out the version on our website, www.noevalleyreccenter.com. (Look under the tab “Getting Involved.”) To learn more, please email Iglesias at thomas.iglesias (at) sfgov.org or his supervisor, Karla Rosales at karla.rosales (at) sfgov.org. 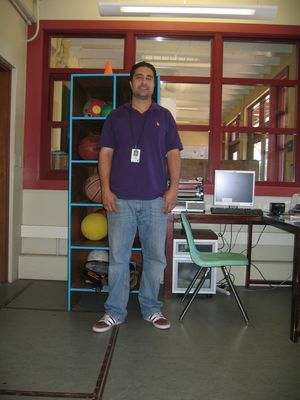 Thomas Iglesias, Upper Noe’s new facility coordinator, stepped into his role in September, and immediately set to work finding ways to build the center’s programming while keeping it safe and clean. Since he started at Upper Noe, Iglesias has worked hard to convene the much-needed Community Recreation Council (see article above) while keeping on top of various repairs, like replacing the worn-down playground mat and fixing the playground gate. His relationship with the Recreation and Parks Department started 16 years ago, when a friend encouraged him to apply for a job as a part-time, as-needed athletic coach. He started with youth baseball. “It grew from there,” he says. Iglesias studied broadcasting at San Francisco State University, but his real passion lies in recreation, he said. His taste in sports is equally catholic, though he admits to only watching—not playing—football these days. A San Francisco native who graduated from Archbishop Riordan High School, Iglesias and his wife Jisel live in Portola with their two “park and rec” boys, ages 14 and 9. “They play everything,” Iglesias said. A chip off the old block, perhaps? No dodgeball, Zumba or girls’ sports? Though tot classes remain popular, classes for older kids at Upper Noe Recreation Center are being cut and consolidated due to under-enrollment. “It’s disheartening, because the gym is there and it’s underused,” said Facility Coordinator Thomas Iglesias, who would like to see the facility inside as popular as the playground outside. This fall, Upper Noe offered two sessions of Taster’s Choice, the girls-only sports buffet that includes archery, track and tennis. But the two classes, divided by age, had to be combined because so few girls enrolled, said Brendan Dunnigan, who teaches archery. “We want to build girls’ programming across the city,” he said. There are many options, including roller soccer, but no class can run without participants. The dodgeball class was cut completely, he said. For adults, one Zumba class was taken off the schedule for lack of participants. It’s a shame, Iglesias said, especially because the teacher, Margaret Silva, is personable and energetic. “She’s very patient, and she talks about lifestyle changes,” Iglesias said. Upper Noe has had as hard a time attracting members to its council as it has attracting kids and adults to its programming. “I invite anyone who wants to be there—come on in, and we’ll figure it out from there,” Iglesias said. Parents, PTA members and school administrators are encouraged to contact the center to discuss possible activities and times. Also, Rec and Park winter quarter catalogs are available to distribute at your school. Contact Iglesias at 415-970-8061 or Thomas.iglesias (at) sfgov.org or his supervisor Karla Rosales at karla.rosales (at) sfgov.org. The Recreation and Parks Department offers two terms of classes each fall, and the second set began this week. Young ones can celebrate the holidays with crafts, songs and stories at Holiday Happenings, a two-day workshop on Dec. 14 and 16 from 10 to 11:30 a.m. Otherwise, the tot classes are full again, but there are several options for tweens. Muay Thai Kickboxing for children ages 9 to 13 happens Fridays from 5 to 6 p.m. Based on the martial art from Thailand, this sport focuses on increasing cardio endurance and strengthening core muscle groups through calisthenics drills and practice kicking and striking boxing pads.Tennis for children 12 and under happens Mondays and Wednesdays from 3:30 to 4:30 p.m. and on Saturdays from 1 to 2 p.m. These basic classes focus on strokes, rallying and playing matches. Students must bring their own racquets and wear appropriate clothing. (Scholarships are available to offset the cost. )There is still room in many of the adult classes, including Pilates on Wednesday and Friday afternoons, cardio salsa on Thursday evenings, yoga on Tuesday evenings and, of course, Saturday’s Zumba class at 9 a.m.Registration for classes running now can be done in person at the Center. Many classes will accept drop-in students. Winter quarter classes will be available for browsing online at www.sfreconline.org starting Monday, Nov. 28. Registration starts Saturday, Dec. 17. You can register online or in person at Upper Noe. Winter ball is here: The Recreation and Parks Department starts its winter youth basketball league in January. 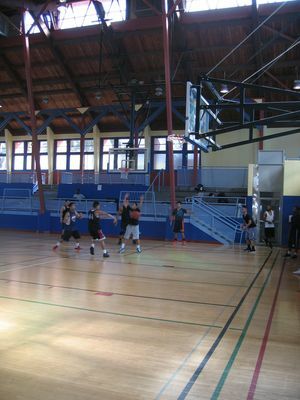 Most of the city’s recreation centers field grade-specific teams that play each other in the city-wide league. Facility Coordinator Thomas Iglesias will offer to field nine teams, from kindergarten to eighth grade. Last season he got enough players for a kindergarten, third- and fourth-grade team. This season he would like to see more. Children join individually or schools can set up a team. Registration will begin November 28, but anyone who is interested can co`ntact Iglesias beforehand by emailing thomas.iglesias (at) sfgov.org or by calling 415-970-8061. Nobody from Nashville is six men from the Bay Area who will delight the tots Saturday, Nov. 12, with their hard-driving bluegrass tunes.The band plays traditional bluegrass songs as well as covers, adding a slight contemporary edge to their sound, said Jamie Maddox, who plays the five-string banjo.“The music is traditional blue-grass based, but we’re not quite that laid back,” said Maddox.Nobody will throw in a few familiar favorites for kids like Wheels on the Bus and Old MacDonald, but the children seem to like the rest of their repertoire, too, he said. The rest of the band is Maddox’s son, Jay, who plays the guitar, Chris Eccles on mandolin, Ron Esparza on fiddle, Jim Dee on upright bass and Jim McCall on the Dobro. Dobro? “It has a twang to it,” Maddox explained. Similar to a guitar in appearance, the Dobro requires a pick and is played with the thumb, index and middle finger, he said. For more information about the band, visit www.nobodyfromnashville.com. 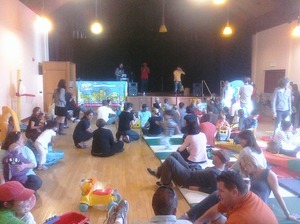 Tot Rock is sponsored by the Friends of Noe Valley Recreation Center through community donations. All families with children under the age of 5 welcome. If you are interested in helping with this monthly event, please email molly (at) noevalleyreccenter.com. The Oct. 29 Halloween concert with Basho & Friends was a smash success. The tot room was full of kids rocking out to the beats from Basho all morning long. Thanks to a meeting between Friends of Noe Valley Rec Center volunteers and Recreation and Parks staff, there are two nice new signs at the park. 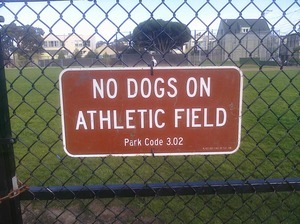 The first, posted on the field entrance, reminds visitors that no dogs are allowed on the athletic field. We haven’t heard reports of any dogs on the athletic field in a while now. The second, posted on the Sanchez street of the park, directs visitors to enter the park on 30th or Day streets. Thank you Kristin Bowman for making us these new signs. Serve as a greeter for the free concerts. The Friends of Noe Valley Rec Center need a “friend” to help us greet families during our monthly free concert. Let them know about our mailing list and introduce them to our small group. Our greeters hand out flyers and accept donations for the concert series. The next opportunity will be Nov. 12 from 9 to 11 a.m. Even volunteering for one hour would make a big difference! 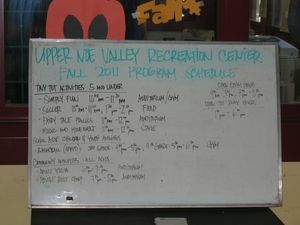 Help advise the city on what classes should be offered at the Upper Noe Rec Center. Serve a term on the Upper Noe Recreation Center’s Community Recreation Council and help shape programming at the Center. Please contact Thomas Iglesias at 970-8061. The form is available on our website and at the center. Please either drop it off or mail it to: Thomas Igelsias, UNRC, 295 Day Street, SF, 94131. Distribute our new Friends of NVRC postcard. This newsletter is distributed to nearly 1,000 “friends.” Make sure interested neighbors know about our group by helping distribute our informational postcard around the neighborhood. Please email molly (at) noevalleyreccenter.com if you know of a good shop or cafe to distribute the postcards. Or you could help put them somewhere frequented by park users. Lead a new event. Are you interested in organizing a new event at the Center? Maybe a game night or movie night? Please let us know. Develop a new plan for the sandbox area or some other park addition. 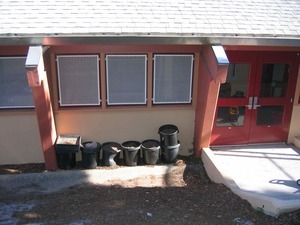 If you know of a person who wants to help re-imagine and re-engineer the sandbox area, please let us know. We are also looking for someone who could add a new creative addition to the park. We have limited space, but we’d love to see a new activity area or artistic addition to the park. The Friends group is looking for suggestions. Garden at the Park. Help keep the park beautiful by volunteering with the Ladybug Gardeners on the second Saturday or every month. All ages welcome, no experience necessary. Even an hour would be a big help! Whether you’ve filled out a form or not, please come to Upper Noe’s first meeting of its Community Recreation Council. We will discuss goals for the council and programming for the center. 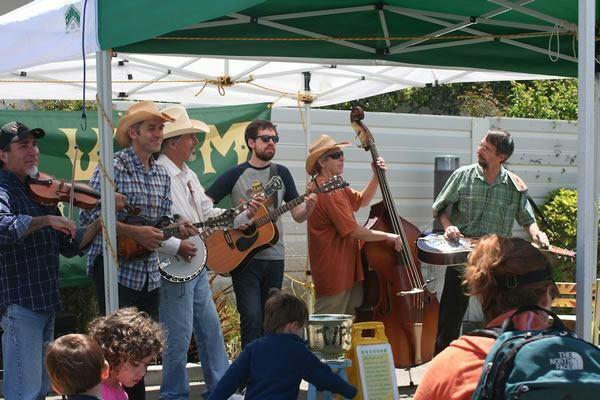 Join Jamie Maddox and his hard-driving bluegrass band Nobody from Nashville at the Saturday concert. The Friends of Noe Valley Recreation Center is glad to sponsor Saturday morning live music in the Auditorium/Tiny Tot room at the Rec Center. Tot room open, too! Come by with your child and enjoy the music. Corey D. Cook, an assistant professor of politics at USF and the director of the Leo McCarthy Center for Public Service and the Common Good, will review and analyze the November election results. Co-sponsored with San Francisco for Democracy.